Looking for a nice way to tell co-workers and clients their emails need help in the etiquette department? Here’s how to sound professional and make connections last with these 10 invaluable tips from startup pro Brian Slawin. Ask first! Before introducing two separate parties make sure both sides are willing to make a new connection. You may lose some valuable contacts by spreading their information around without asking first. CC & BCC. Know the difference between the two. CC means everyone can see and reply to those on the thread, while BCC allows people to know what’s going on but not be seen by others. Choose carefully! Utilize the BCC line! Move the originator of the introduction to the BCC so they see you’ve acknowledged the intro and appreciate the connection, but don’t have to be part of the scheduling details to follow. Use your manners! If a great introduction is made that leads to a lasting connection be sure to send a follow up email thanking the originator of the intro. A thank you goes a long way in business! Leave your digits. Make sure your signature, which you should have by the way, includes a phone number. It is extremely helpful for people to get a hold of you outside of email and feels more personal. Make it easy on others! Adding to number 3, make sure your phone number is in a larger font and away from other elements on the signature. This way contacts can get a hold of you just by clicking on the number instead of having to search through websites and emails to find it. Most of us don’t have unlimited data plans. If there is a huge file to send be courteous and ask the recipient if it is okay to send it via email. Get familiar with Dropbox, Box, iCloud, Google Drive, etc. Especially for those huge files that take up huge amounts of valuable email space. Stay Organized! Keep separate projects/conversations on separate threads. This way no one has to go keyword searching through their inbox to find the details they need. An oldie but a goodie: Make sure to use complete sentences, proofread your text and spell everyone’s name correctly. 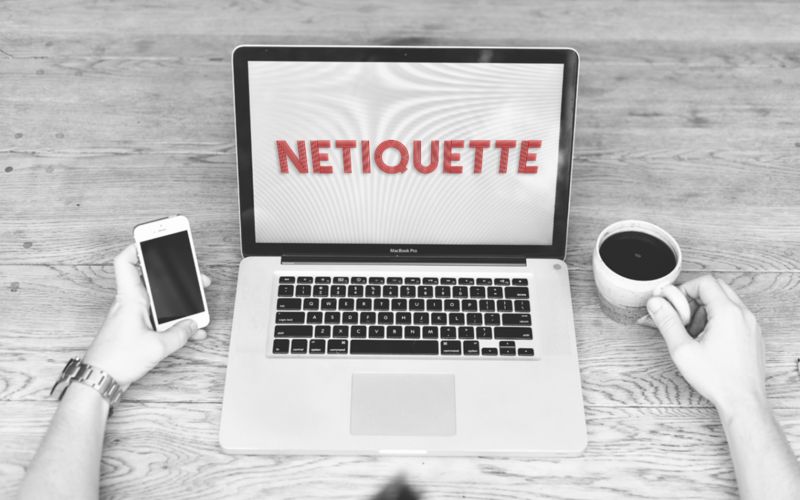 Feel free to leave your own etiquette tips & share this list to save us all from cringe-worthy emails!